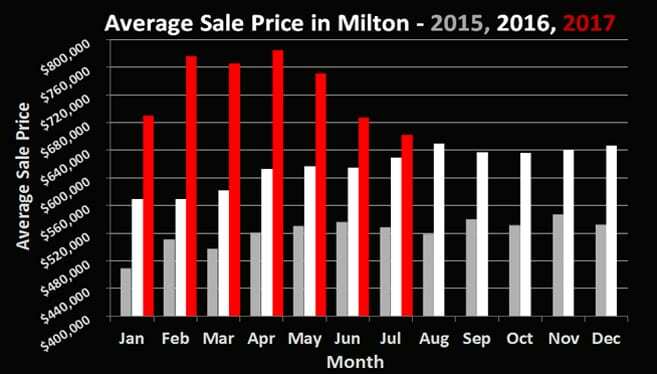 Continued slowdown in Milton, but could things be looking up? 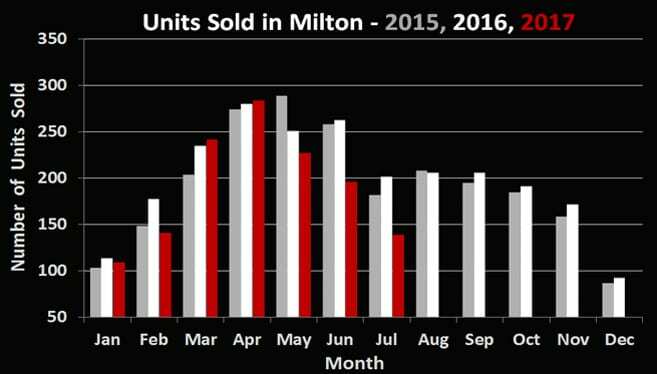 The 139 Milton residential sales in July 2017 represent a large decrease in volume of nearly 45% when compared to the volume recorded in July of 2016. The average sale price, while still up 5.2% from last July (currently $662,600), has come down significantly from the peak of $785,000 back in April. It appears as though in recent weeks, numbers of showings and offers in Milton have started to once again increase. Buyers appear to be stepping back into the market after a period of uncertainty, much like what was experienced in the Vancouver area last summer. Shortly after the foreign buyer tax was imposed on that market, prices declined ~10%, only to be back to record highs roughly 8 months later. It appears the Milton market is currently starting another upswing, and the market post Labour Day will be more balanced. If you’d discuss this ever changing complex market, or if you’d ever like to discuss anything Real Estate related, we’re never too busy to chat.